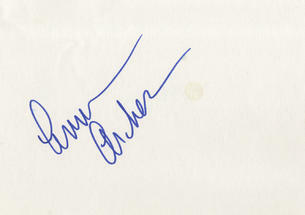 This is an In Person signed white card 5.75" x 4" by the American actress. Anne Archer (born August 24, 1947) is an American actress who has performed in feature films, television, and stage and was named Miss Golden Globe in 1971. She has appeared in a wide range of films such as Fatal Attraction for which she was nominated for an Academy Award.